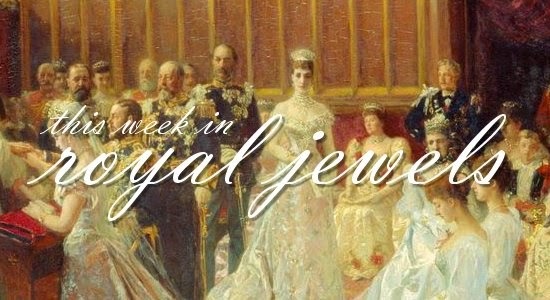 State visits, awards ceremonies, and even LEGOs -- just your typical week in royal jewels. Enjoy! 10. While many of the royals were at the state banquet on Tuesday, the Duchess of Cornwall was busy supporting another family member, her son Tom, at the launch party for his new book. She wore her Van Cleef and Arpels dragonfly clips, one set with diamonds, the other with blue sapphires. 9. Most of the sparkle from Queen Letizia of Spain's ensemble at the International Journalism Awards in Madrid on Monday came from her glittering dress, but she also wore a pair of small diamond stud earrings. 8. Princess Anne headed Down Under this week to speak at the Commonwealth Agricultural Conference in Brisbane. The subject matter of Tuesday's talk may not have been particularly glamorous, but she added interest to her outfit with a gold-toned brooch. 7. At a meeting for Child Focus on Friday in Brussels, Queen Mathilde of the Belgians continued her recent trend of wearing large earrings, this time a pair featuring golden concentric circles. She also wore a gorgeous sapphire and diamond ring on her left hand, a ring she often alternates with her diamond and ruby engagement ring. 6. Another outing for Camilla this week: she wore her pearl choker the round diamond clasp on Monday's visit to Birmingham. 5. Crown Princess Victoria wore a striking beaded necklace to an event with the Stockholm Environmental Institute on Wednesday. ...and also managed to capture a good close-up shot of her bracelets and ring. 3. After participating in the Singapore state visit earlier in the day (see our coverage of the visit here, here, and here! ), the Duchess of Cambridge headed to the Museum of National History on Tuesday evening to attend the Wildlife Photographer of the Year Awards. She debuted a new set of jewels at the event: a necklace and earrings from the Riva collection by Monica Vinader, a British jeweler. Both pieces feature rose gold settings and pavé-set diamonds. 2. The Windsors weren't the only royals in state-visit mode this week: Queen Margrethe II and Prince Henrik of Denmark paid a state visit to the Croatians. She was in her element on a visit to a folk costume exhibition on Wednesday, where she wore her ruby brooch in the shape of grapes, a gift for her 70th birthday from the Masters of the Royal Hunt. (She also wore, well, that hat.) The night before, she wore sapphires and diamonds to the state banquet. 1. And finally, we wrap up this week's royal jewels with a tiara that you can all afford -- because it's made of plastic. On Saturday, LEGO World in the Netherlands unveiled life-sized replicas of King Willem-Alexander and Queen Maxima in their finery from his 2013 investiture -- naturally, including the sapphire and diamond tiara, brooch, and earrings that Max wore on the day. Both fun and terrifying!